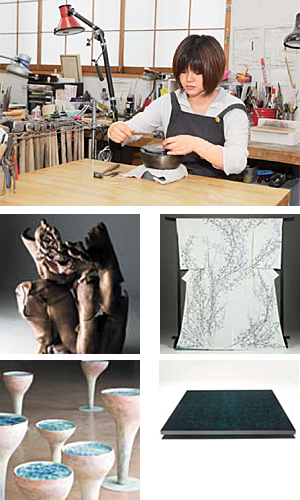 This department consists of the following courses : ceramics, metal casting, chasing and hammering, urushi lacquer, dyeing and weaving. Students are expected to challenge to hone their contemporary craft sense through applying the traditional craft methods to their own creative projects. Many of these students earn prizes at prestigious public exhibitions. The facilities provided at each studio are repleted substantially enough for students to develop their techniques and ideas. A characteristic of our school is having strong ties with local industry since crafts are both traditional and popular throughout Kanazawa. Students in the master program develop their specialized techniques and ideas. One goal of doctoral students is to apply their original creativity to writing insightful theses as well as completing their pieces. Many of our foreign students have become artists or teachers and served an important cultural function in their home countries.